Despite a lackluster economy, a lot of people are thinking of remodeling their baths and are willing to pay to do so. However, experts say, you don't have to have Bill Gates' income to create an attractive, comfortable bath for your family. "I would tell you, " says Thompson Price, president of Callier and Thompson Kitchens, Baths, and Appliances in St. Louis, "that for a standard 5' x 9' bath redone from floor to ceiling, the minimum price is not going to be much under $10, 000. That's not top-of-the-line products, but it's not the most inexpensive products, either. It's good quality, decent products done properly by licensed tradespeople." With $10, 000 to spend, it's important that you tackle the project with simplicity in mind. "You can actually do it for less than $10, 000, " says Janice Costa, editor of Kitchen & Bath Design News, "if you keep it within the same footprints. Usually, you start talking about a lot of money when you start moving plumbing around." Shower or tub, toilet and sink should all stay in the same locations. Thompson Price of Callier and Thompson stresses that while the temptation to cut corners may be great at this budget level, the resale value of your home rides on following the building codes. "We have customers who say, `I've got a bid from a guy, he's going to do all the work himself, he doesn't do permits, and he'll do it the way it's supposed to be done, ' but, frankly, that doesn't meet code requirements, " Price says. "You can't have a carpenter doing all the plumbing, electrical work and tile work. That's not to say it doesn't happen, but people who do it are at risk when they go to sell the home." "A fresh coat of paint does a world of good, " says Sabrina Foulke, architectural designer at Point One Architects + Planners in Old Lyme, Conn. "What we try to do is make the bathroom walls fairly neutral and then accessorize with towels and other elements. Neutral doesn't mean white, either; the basic color could be blue, pale pink or yellow, as long as things are unified, and then you add items to pop as decorative elements — paintings, pictures on the walls, soap holders — and just have fun with it." Janice Costa says that fun can pay off when you put your house on the market. "People who are thinking in terms of resale use a neutral base with a nice accent color, " she says. "Watercolor blues are still projected to be hot in 2012. A lot of people are looking for something that will have long-term appeal." Savings can be realized by using prefabricated showers or bathtubs, or shower-tub combinations, made of fiberglass or acrylics. Tile can be expensive, and the labor involved in laying tile that doesn't leak is complicated, as well. "It's much more labor-intensive and, therefore, more expensive, " says Sabrina Foulke, "than if you just went out and bought a 76-inch square shower form." Acrylic liners can also be installed over an existing tub or shower wall to provide a handsome new finish. "They don't last forever, " Janice Costa says, "but if you're talking about staying in a house just three to five years, that's a very popular option." At $10, 000, seemingly small improvements can yield handsome results, and, therefore, increase a home's value. 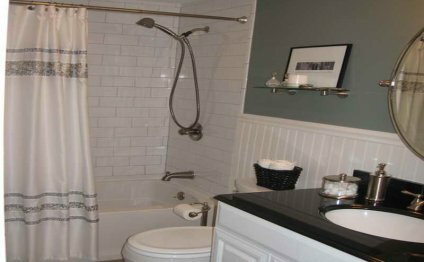 For example, Sabrina Foulke says replacing an old shower door with an accessorized shower curtain "can make a huge difference. Old shower door frames can get pretty nasty, so curtains are a way to redecorate easily." "One thing we've started doing, " says Foulke, "is using pendant lights in the bathroom. Sometimes people have these old Hollywood-style lights built into their bathrooms from the '70s. Just replacing them with a really beautiful light fixture that hangs by the sink works well and looks good." "If you really want to spruce up the bathroom quickly, " says Foulke, "the biggest change would be the vanity — replacing the vanity cabinet, the top and the bowl, or even just the top and bowl and then painting the cabinet." "Hair dryers for women, built into vanity cabinets, is a cool little thing, " Foulke says. "You can put a plug in the cabinet and then hang the dryer inside the cabinet on a hook, plugged in and ready to go. All you have to do is open the door and dry your hair. It's a little thing, but it can make somebody happy if they don't have a lot of money to spend."